I'm not feeling great today - pounding headache, overall feeling of yuck, etc. Fun stuff, right? Classic November misery. I remember pre-kids (and also pre-blackberry), when I felt sick and could just doze in bed all day. Nowadays, blackberry-guilt keeps me from dozing off, and despite me feeling cruddy, the hordes apparently still need to eat (and so do I, and I still need lunches for tomorrow). So I still have to cook. I wasn't really feeling up to anything crazy/elaborate, and I haven't got groceries in a while, so I was a bit restricted in what I had (mostly in terms of produce). I was flipping though old versions of Clean Eating (which, BTW, is coming back on shelves - yay! 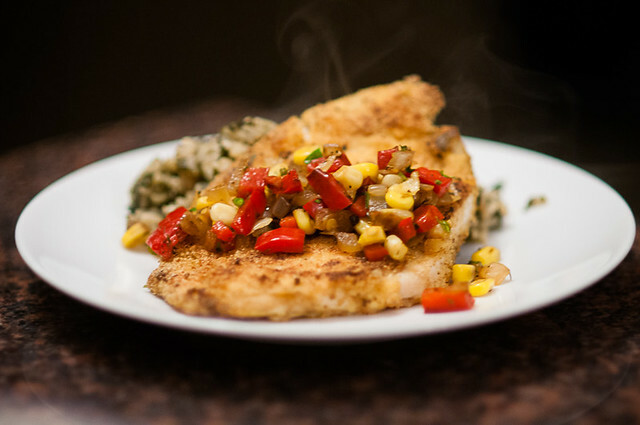 ), and came across a recipe for catfish fillets with warm corn relish - I loved the idea, and I knew I had most of the ingredients (and haddock in the freezer, in lieu of catfish). The dish came together well - the fish was very flavourful, and I liked the sweetness of the corn and peppers on top of it. The only downside is that this creates a bit of smoke as you're pan-frying (at least, it's a downside in my new kitchen, because I don't have a hood fan. Some day.....some day, my friends). You can peek at the kitchen here (this is, of course, *before* I put all my stuff in it). I'm hoping to redo the kitchen at some point, as while it looks pretty, there are some brutal functionality issues. I didn't think that just fish + smattering of corn relish would be satisfying to my crew, nor would it be terribly economical, so I decided to do a rice side. When I was a kid, every once in a while, we would have Uncle Ben's Rice Florentine (which doesn't seem to exist any more) and I always LOVED it. It was delicious salty rice with bits of spinach (Florentine, right?). Of course, I try to avoid too much processed food, and buying rice in pre-flavoured tiny boxes is a REALLY expensive way of serving rice. The recipe I came up with is pretty darn close to the flavour of the classic, ups the health factor with brown rice (though negates it with onion soup mix - oops) and also uses an entire package of frozen spinach. I love this because you can buy massive bags of brown rice, you can stock up on frozen spinach on sale, and onion soup mix is relatively inexpensive (you could EASILY sub this with homemade broth and dried onion flakes - about 1/4 c of them if you wanted to avoid the onion soup mix - adjust salt to taste). The great thing about this dish is that you toss it all in the rice cooker, and let it go while you prepare the rest of the meal. It's super tasty and zero fuss. 1. Put rice, onion soup, chopped spinach and water in rice cooker. Stir. 2. Turn on rice cooker and let it do its thing (about 40-45 minutes for brown rice). 1. Prepare the relish - in a large skillet on medium high, preheat olive oil. Add onion, red pepper and thyme and cook until veggies start to soften (about 3 minutes). 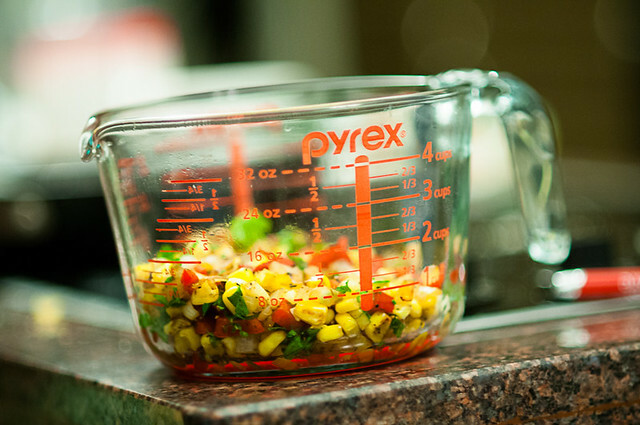 Add corn and cook for 2-3 minutes. 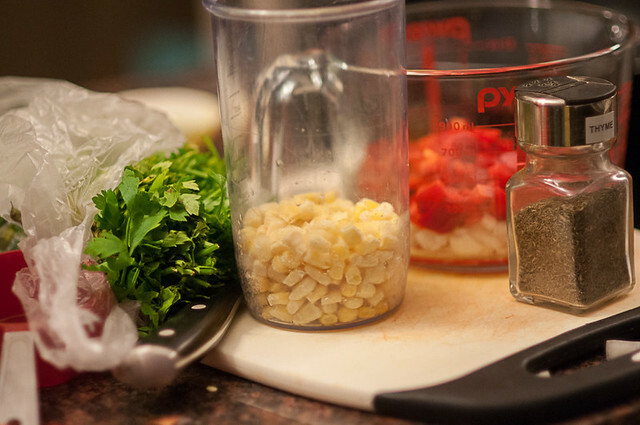 Remove from heat, add balsamic, parsley, salt and pepper to combine, then put in a small bowl. Cover to keep warm, and wipe pan out with a paper towel. 2. Beat the egg in a large dish. Add haddock and coat with the egg (I actually put the egg in the bag my haddock came in, because I'm lazy (efficient?) like that. 3. 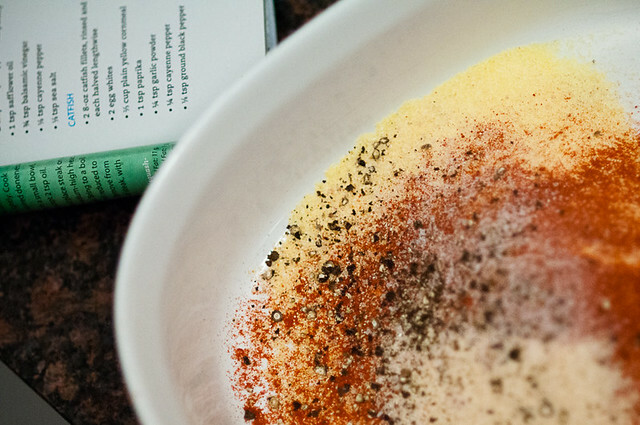 In a shallow pan/pie plate, combine cornmeal, paprika, garlic powder, pepper and salt. Re-heat your pan on medium/medium-high. Coat 2-3 pieces of fish (depending on the size of the pieces and the size of your pan - you don't want them touching), add the butter to the pan, and then add the fish. Cook 2-3 minutes each side, adding more butter as necessary and then repeat until all fish is cooked (my fillets were large, so I cut most of them in two). Check the thickest fillets to make sure they are cooked, but fish doesn't take long. 4. 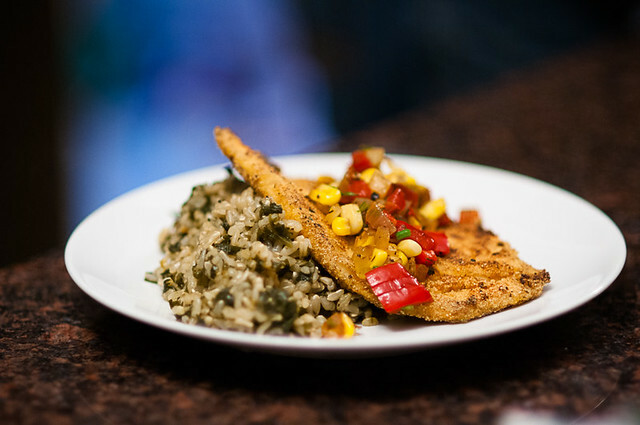 Serve fish with corn relish over top. Love the florentine rice adaptation, especially done in the rice cooker. The fish looks delicious; can't wait to try it with the smoked paprika. Awesome! PS So glad to see you posting again! Please keep posting your wonderful recipes!